'Tis the season. Yes, the holidays are nearly upon us, but really, we're talking about cough and cold season. Once people start staying indoors and sharing germs, those wintertime maladies start piling on. While there is no cure for a virus (your doctor will tell you it has to run its course), there are a few things you can do at home to alleviate some of your symptoms so you don't feel quite so horrible. Here's what a few doctors have to say on the topic. Is your throat sore, either from a viral infection or drainage from your schnoz? Dr. Nadia Shaukat, physician and associate medical director at Paradocs Worldwide Inc., tells SheKnows saltwater may give you some relief. She suggests dissolving a half-teaspoon of table salt into 8 ounces of warm water and gargling up to four times a day. If your nose is stuffy, you know how miserable it is just to breathe (not to mention sleep). Thankfully, there's a nifty remedy you can do at home to clear those nasal passages up: breathing in steam. Shaukat says a humidifier can work, as can warm showers. However, if you're feeling weak or dizzy and standing up is a problem, she recommends a warm tub bath instead. There are a few different types of teas that can help your cold symptoms, physician Dr. Maiysha Clairborne tells SheKnows. "Peppermint is a natural cough suppressant and helps to open the airways when you feel congested in the chest," she shares. Also, India spice tea (including cinnamon, cardamom, ginger and black pepper) can help open up the chest and sinuses, she says. 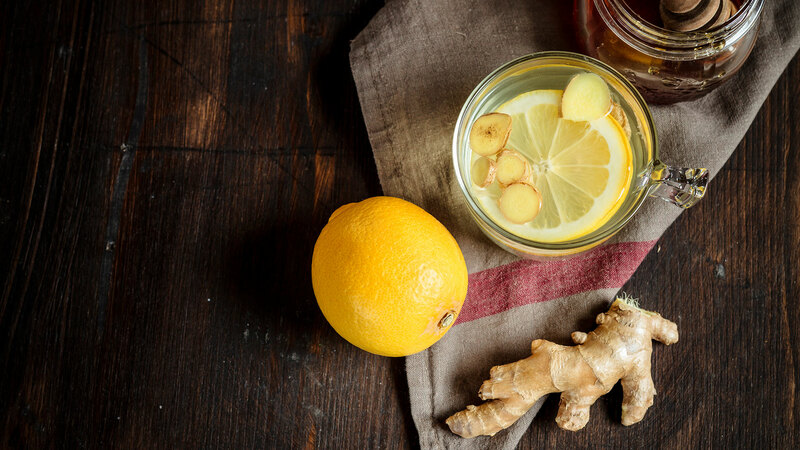 "Fresh ginger is a great way to fight off cold and flu and its symptoms," says Clairborne. She suggests blending fresh ginger and drinking it as a shot (but definitely dilute it with water, as it's pretty spicy and potent). You can also boil it for 15 or 20 minutes and add some honey. Honey has been known to be a common item to turn to in the event of a viral illness. Shaukat says that it works well on a cough, so you can add a tablespoon or two of honey to a cup of warm water (or tea!) to get your honey in. It's also soothing for adults and older children who have a sore throat. "Honey, however, should not be given to infants or very young children, as it may have botulinum spores, and their immune systems may not be strong enough to handle it." Chicken soup is soothing because it's warm and helps you feel comfortable, but that's not the only reason, says Shaukat. "Chicken soup contains an amino acid that acts like a drug called acetylcysteine, which is used to treat bronchitis," she explains. So not only is it a comfort food, but it may also actually help you get better faster. Sleep is definitely not overrated when you're feeling sick, Dr. Ian Tong, a physician and chief medical officer at Doctor On Demand, tells SheKnows. And while sleep is not something you can buy at a store, it's an at-home remedy that can actually help. Sleeping will help your body have a chance to recover, he notes, and while you're not working on getting those z's, definitely don't overexert yourself. Your energy is best conserved to help you recoup your good health instead of trying to get a few extra chores done. While many turn to vitamin C supplementation when they're under the weather, Tong says it may not do a whole lot of good after you're feeling ill. "Vitamin C is effective with cold symptom duration if you use it for prevention, but it is not as effective after you get sick," he warns. This means if you take vitamin C on the regular, it may shorten your cold but might not do a darn thing after you've come down with a cold. While you can't go to a doc and get a cure for a viral illness, there are a few things you can try right there in the comfort of your home. Thankfully, these methods are doctor-approved and may make your journey to good health a little shorter — or at least less miserable.